Here’s a little bit more about personalization and its impact on influence. In Looking at Things Through Geeky Eyes I noted some expectations I’ve got with personalized experiences. I used Amazon (who still occasionally get things wrong) and Google Now as examples of personalization which are great for experience and for the business. Here’s a couple more examples. One is of a company doing things right and one is of something wrong and more of a rant. I’m not currently a Netflix customer but when I was, I always liked the way the site would help me discover new movies or shows I would have missed otherwise. The recommendations engine continues to power the experience and is great for giving customers a reason to stay with the company. In an effort to continually improve the service, Netflix noticed customers having issue with how some of the personalization was being done. I’m not sure how they picked up and prioritized the situation – analytically or through complaints – but they were on the ball. Delivering an improved experience and showing they care. Customers would have their queues mixed between areas such as kids shows, action movies, and rom-coms so the recommendation engine was shuffling the results. With 20-20 hindsight, it’s obvious that there may be different people meeting different profiles using the same account. I have two boys and our movie tastes clearly overlap but I wouldn’t want some of my psychological thrillers showing up when they’re hunting for shows. The end result is Netflix giving account profiles to their customers for individuals to use. That way, each person using the service gets their own content. Not only does it add value, but it shows the company cares about their customers. It’s good selling and there’s probably a lot of customers who are happy about it. Now for the rant on something I see done wrong – a lot. Recruiting on LinkedIn. Personalization helps with small things like movie selection and considered purchases. There are very few decisions which require as much consideration as a career move. I’ve seen a bit of poor work by people paid specifically to find a match for a job and influence/sell a prospect on it. When they have all the information they need, an impersonal approach is a big turnoff. I’m not shopping for a job, but if I were then this is not going to turn my head. Let me break down what I’m talking about with a recent message I got. It seems fairly typical of someone using an automated tool without much thought. Reply or mark as spam? There’s an acronym in the job which I don’t recognize and it’s repeated in the body of the message. Either I’m completely wrong for this position or you’re not telling me what it actually is you want sold. 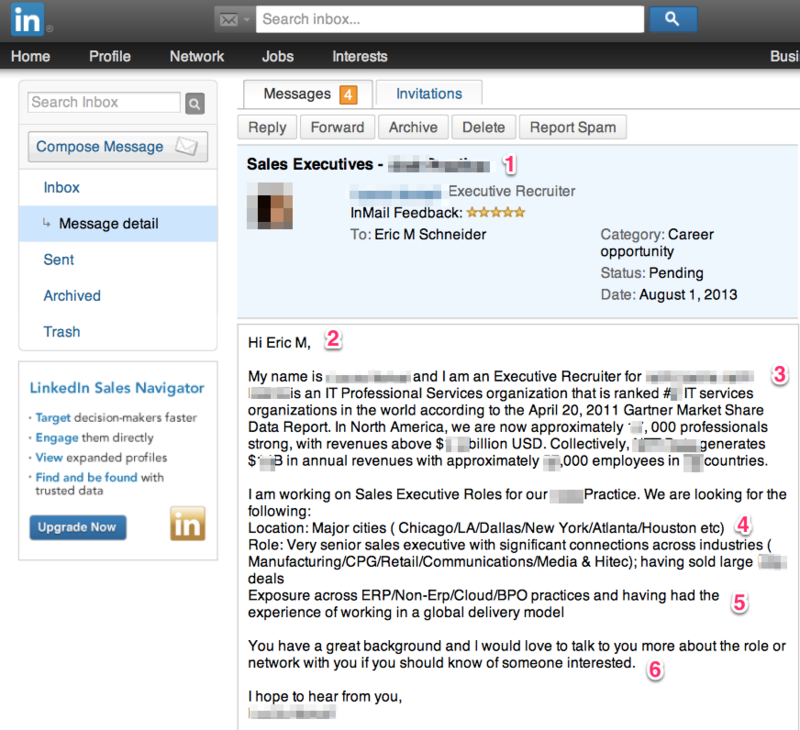 The first name in my LinkedIn profile is Eric M since there are multiple Eric Schneiders out there. If I get a “personalized” message like this then I know you’re just spraying and praying. You haven’t actually looked at my profile and you have no idea why I’d be a great fit. Great. The company’s successful and that’s important. But why would I want to work for them? What’s exciting for my daily life other than being a cog in a big piece of machinery? Do you hire the best and brightest? Foster a creative culture? There’s no passion or mission behind numbers like that. They were great according to a study back in 2011. Now? Plus, the editing is sloppy and poorly worded. More spray and pray. I live in Atlanta. At least send specific messages to people in Chicago, LA, Dallas, New York, Atlanta, Houston, and the thriving metropolis of Etc. I don’t know if that’s Etcville or Etcburgh but I don’t live there. Leave the “Location” section out if you’re targeting me because I live in one of them. Can you possibly be more vague? ERP and Non-ERP? Quantum physicist, litigator, and alligator wrestler fit in one of those buckets. I’ve made a reasonable attempt at masking the person who sent that message and wish them no ill will. But this is the mirror image of what I praised Netflix for and it’s not going to yield results. It’s utterly unpersonalized and shows no thought, effort, or care. In a world of increasingly sophisticated interactions, poor attempts stand out. Technology is a tool which can help make connections but if there’s no real intent then what you hope for and the results are going to be two different things. Previous Previous post: What do People Like to Read?